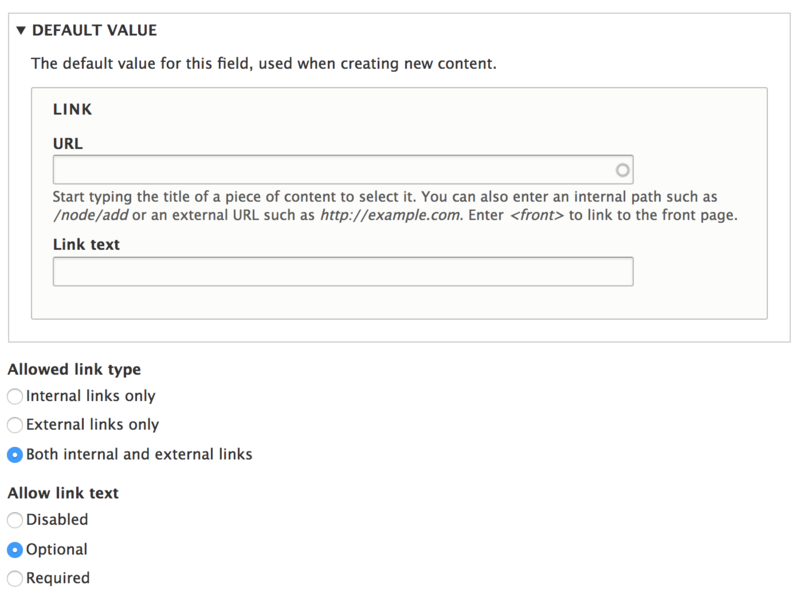 I have a Drupal link field configured to allow both internal and external links and have the title field enabled, but optional. I want users to be able to reference internal entities without having to specify anything in separate title field, and have the Link field's title pulled from the entity label. However it appears that when the field's internal title value is left null, Drupal ends up using the field's uri value as the link title. This behavior seems odd to me. My question is this: given an internal uri value that looks like: entity:node/3500 how can I preprocess or alter the functionality of the Link field to load in the entity's title/label as the title when it is left empty by the content editors. I've searched for issues on drupal.org but didn't turn up much of anything useful. I found Get title from Route, which seems to recommend using the TitleResolver, but that depends on putting together a $request object, which seems extremely impractical. * Prepares variables for link fields. // label as the link text. This is working with both the standard Link field formatter as well as the "Separate link text and URL" formatter provided by Drupal 8 core. My only doubt here is that I'm not sure how safe it is to assume getRouteParameters() will always be keyed with an entity type name and a value of the entity id. Would appreciate your help to review and vet this. Thanks! Not the answer you're looking for? Browse other questions tagged 8 entities or ask your own question. Proper way to remove an item with custom widget? Is there any way to number Paragraphs rendered so as to have a numbered list rendered? How to alter a form element's properties before rendering? How do I set field mapping in the Feeds module for Drupal 8? Throw entity field value from submission to route path? Can I get Entity Cache Tags from a Route?